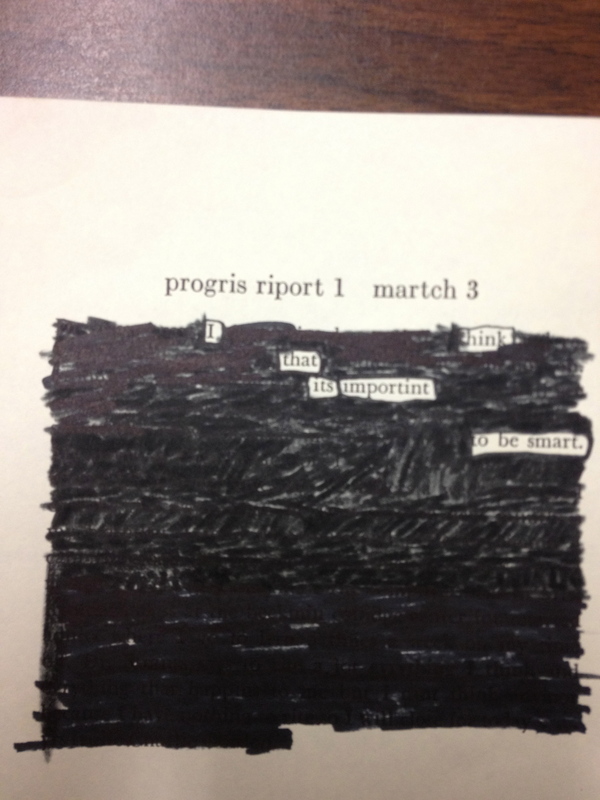 our first Blackout Poetry Week will be held April 7-11th! 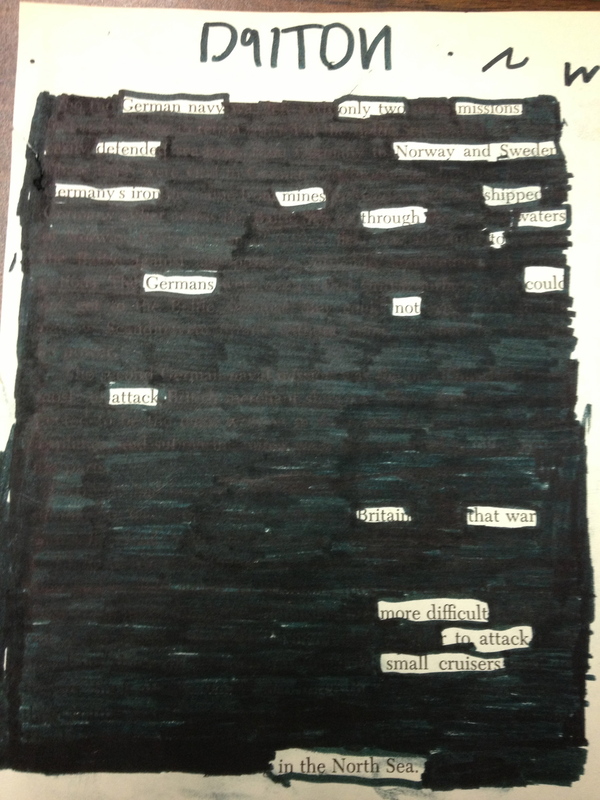 If you don’t know a lot about blackout poetry, I suggest you check out Jason’s awesome post here. Basically, here’s what you need: enough Sharpies for your entire class, willing students and texts to use for their poems. Anything works, and I have used newspaper and magazine articles, random pages from discarded books and even texts that students have already read. 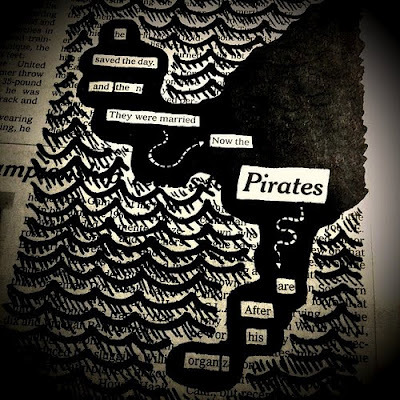 I like to show the blackout poetry guru Austin Kleon’s work as a starting point before we dive in. This time lapse video captures students’ attention and they are very curious about this activity. I work with struggling readers and this is something that, with a little practice, they really have success with. Poetry is a tricky temptress – students are drawn to the idea of poetry, but it is scary and elusive and hard to wrap their heads around. 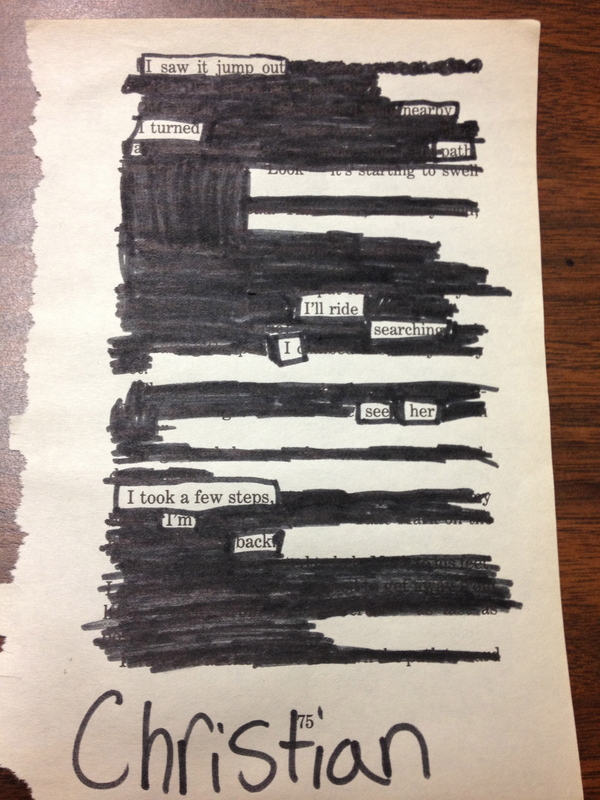 Blackout poetry is safe, cool and very, very creative. The visual and text combination is awesome! There’s no doubt that students are definitely doing some higher level thinking and I’ve seen even the toughest critics (aka 7th grade boys) dive in. Truth be told, the sharpies don’t hurt either. This is my personal favorite. Eighth graders had recently finished reading a short story version of Flowers for Algernon and Noah pretty much captured the entire beginning of the book with his poem! Love it! 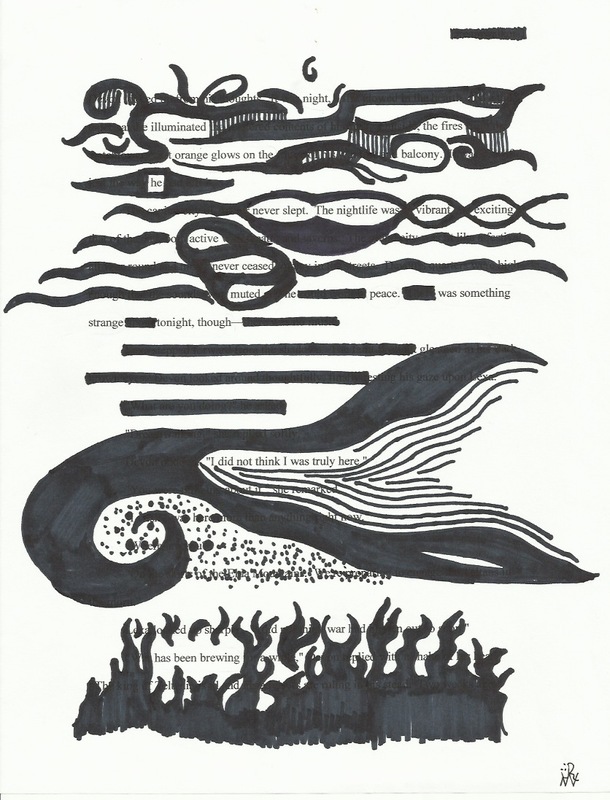 I’d really like to copy various sections of a read aloud or a text that students have all read in their ELA class and have them create a series of blackout poems that capture the mood, actions or development of a particular character throughout the book. Old Encyclopedias would be an interesting text to use too. 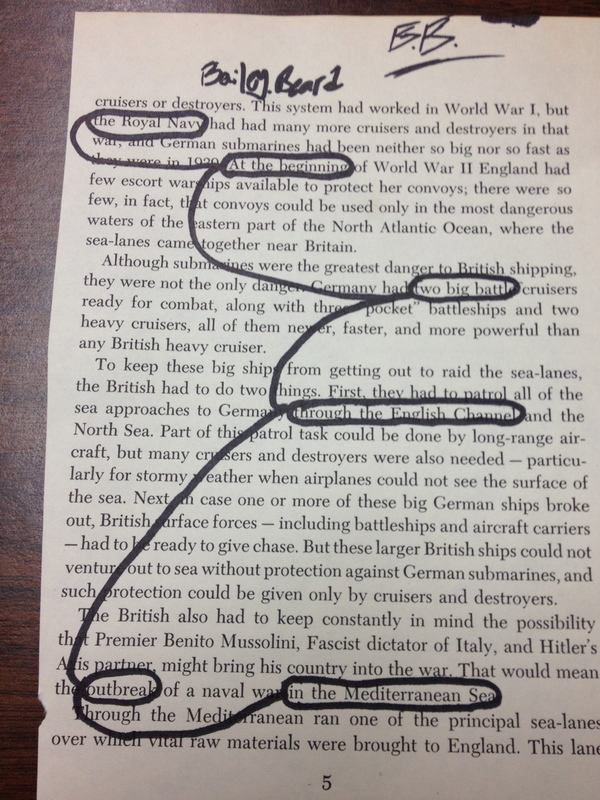 It would be fun to use pages containing outdated information and see what students come up with to use for their poems. 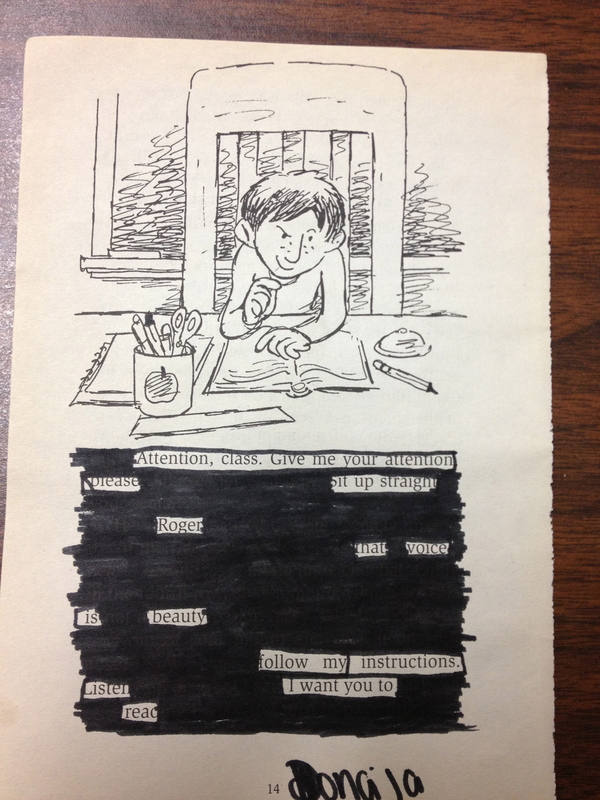 Younger students will definitely enjoy blackout poetry and this would be a great way to celebrate learning new words. Another cool idea for older students would be to use banned books for this activity! 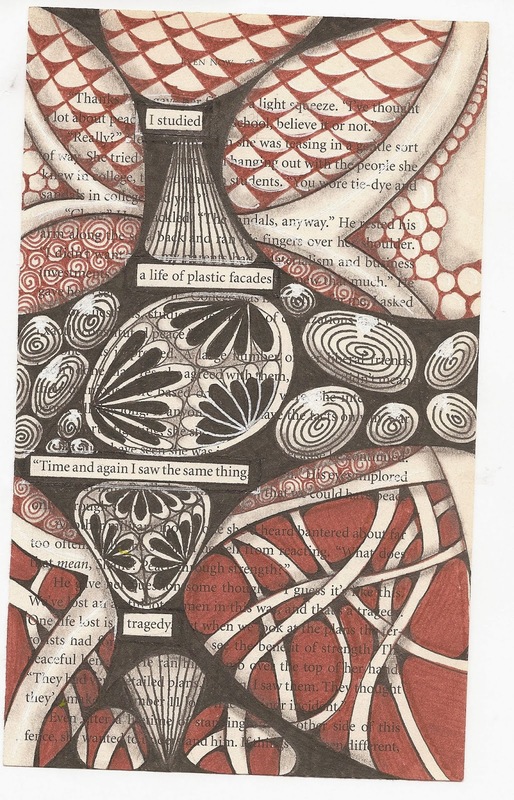 I’d also like to have students get a little more creative with the style of their poems and create a picture or design that fit with the subject or emotions of the subject. Aren’t these amazing? Jason and I hope you’ll join us in April for Blackout Poetry week. Follow Blackout Poets on Twitter for more examples you can share with your students and more updates and reminders about this worldwide event!